It’s hard to understand how something as benign as the nuclear family sparked riots in Verona, Italy this past Saturday. 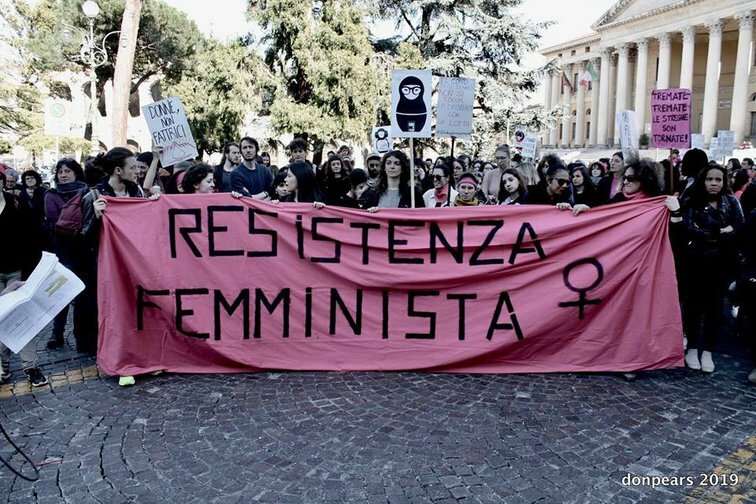 Nevertheless, The 13th World Congress of Families actually required security in Verona as the left sparked counter protests around the location of the event, where a reported 20,000 LBGT and feminist groups required riot police and soldiers to set up roadblocks. When speaking at the Congress, Italian Interior Minister Matteo Salvini discussed the atmosphere the media played in the violence, saying it “was not normal” to need protection from riot police to speak about something as uncontroversial as the nuclear family. But isn’t it? Hasn’t it become normal for the far left to vehmenently oppose the traditional family? Simply put, the destruction of the nuclear family is just one part of a long-term plan by the United Nations that was signed onto in 1992 by former President George H.W. Bush along with 178 other world leaders. The UN dubbed the plan Agenda 21 because it was the Agenda for the 21st century. U.N. Secretary General Maurice Strong said in 1992, “The affluent middle-class American lifestyle is unsustainable. That includes single family homes, private vehicles, appliances, air-conditioning, and meat-eating.” War was declared against the American people decades ago. 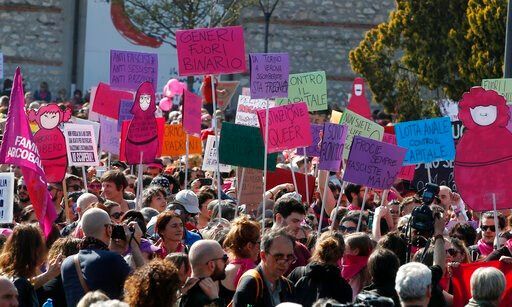 Organized protests in Verona, Italy at the 2019 World Congress of Families. AP Photo/Antonio Calanni. So what was tise vision of the UN? Agenda 21 was conceived in 1992 in Rio DeJaniero at the “Earth Summit.” Its original name, “Sustainable Development,” began in 1987 with Gro Harlem Brundtland, Vice President of the World Socialist Party. The Agenda was passed under the unscientific presumption that the world was running out of natural resources. Agenda 21 is not a conspiracy theory, but a comprehensive plan of action to be taken globally, nationally, and locally by organizations of the UN, governments, and major groups in every area in which humans impact on the environment. Under the buzzword of sustainability, Agenda 21 policies have been systematically enacted year after year through feminist groups, environmental groups, and global groups, all of which seek to seize public property, cars, and resources and tear down the family and individual sovereignty. And for 27 years, the world has been running under the insidious policies of the World Socialist Party, including the GOP—all under the banner of feel-good environmentalism. Just let that sink in. But the Agenda 21 plan covers much more than environmental issues. It’s a power grab to enact global policies at the local level, targeting individual freedoms and attacking the nuclear family under the guise of sustainability. In fact, the Commission on Population and Development is one of the main battlegrounds on which radical feminists and their U.N. allies fight conservative and pro-family advocates with its misguided women’s agenda. And according to plan, media that did report on the counter protests, framed the World Congress event as Alt-Right. A Euronews title declares, “Protests in Italy as far-right party holds family values conference.” It’s incredible that to be concerned for the state of families globally, sparks this type of animosity, but it becomes much clearer when one sees how the media is the main protagonist. The media is no longer made up of journalists, but activists employed to push an agenda. The Guardian reported, “Christian right summit in Verona draws massive protest.” And there are dozens of other headlines all decrying the group as anti-LGBT and anti-women. According to the Guardian’s hysterical report, “The protest was brought together by about 70 rights associations from across the country.” A simple reminder to the conservative right that these protests are never organic. These were organized protests by feminist and LGBT organizations who became inflamed by a antagonistic and activist media—groups all conceived by the World Socialist Party and born out of Agenda 21. If you don’t think there is a concerted effort to destroy Christian values and traditional families, you had better wake up. There is a conspiracy, but it isn’t a theory. Until Europeans and Americans stop cowering and begin to speak up for their values, the world will be lost. We are literally on the brink of having our voices completely silenced. Facebook CEO Zuckerberg said on Saturday as the Verona protests erupted, “I believe we need a more active role for governments and regulators. By updating the rules for the internet, we can preserve what’s best about it—the freedom for people to express themselves and for entrepreneurs to build new things—while also protecting society from broader harms.” Is there really any left among us who thinks Zuckerberg cares about personal freedom?